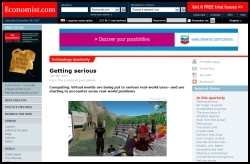 The Economist is currently featuring an article that focuses largely on virtual law. Sean Kane, one of my co-chairs on the committee on Virtual Worlds and Multiuser Online Games of the American Bar Association’s Section of Science and Technology Law, commented for the piece, along with Ted Castronova, Dan Hunter, and some of the other usual suspects in virtual law. It’s a good, fairly straightforward introduction to the current questions in this field, and a great article to forward to colleagues who are not yet familiar with virtual law if you are an attorney considering focusing your practice at least partly in this area.